I guess my post yesterday was too much — Sometimes I get a bit macabre and wish people want to be so with me…but no such luck. Back to happy news, it’s way better and there’s plenty of sad news without me mentioning it. Today my facebook page is aflutter with news and quotes from Steve Jobs and on the other end of the spectrum with the opening of a new BOOK STORE for children in Katonah. Now, I’ll admit I read from a kindle and an iPad more often than not…but a kids’ book store? Heaven! When Borders announced it was closing its doors, I nearly panicked. I LOVE taking my kids to the book store, I delight in browsing kids’ titles, from the littlest people to the tween section, and find it is by far my favorite baby gift, birthday party present, or indulgence for a favorite niece or nephew, and I almost never say no to my kids when they want to buy a new book. What fosters more creativity, what brings their imaginations alive, and most importantly…what gives me more quiet, peaceful time in my house? BOOKS. 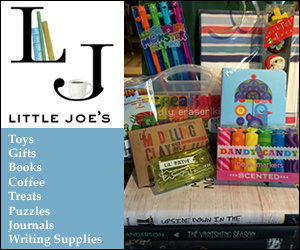 Little Joe’s Books — Grand Opening — Thursday, October 6th. Please join us for a weekend of reading and fun! Thursday is National Mad Hatter Day — wear a Mad Hat and win a prize. 4:15 Story Time with Miss Kathy (3 years old and up) — open until 8pm our first night. Stop by and join us for a celebratory glass of cider or wine. Saturday, October 7th. 3:00 pm. Meet Whoopsie Daisy, our Reading Dog. Reading out loud can be hard for some kids, but it’s never intimidating to read to a loving, non-judgemental dog. Learn how to sign your child up to read to Whoopsie when she visits us again. Sunday, October 9th. 3:00pm. Story Time: Little Chicken’s Big Day. It’ll be a big day for us too, when local husband and wife team, Jerry and Katie Davis, stop by to read and draw from their charming new children’s book. Monday, October 10th. 11:00 am. Book Talk: A Wrinkle in Time. Are you a fan of A Wrinkle in Time? Local author Lena Roy stops by the talk about her grandmother Madeline L’Engle’s life and work, and perform some selected readings. Free balloons all weekend long for everyone who loves children’s books! Little Joe’s Books, 25 Katonah Ave, Katonah (upstairs from Noka Joe’s across from the train station). 914-232-7278. Open 7 days – Monday through Friday 9-5:30pm. Saturdays 10-5:30pm, and Sundays 10-4pm.